Villa Slow is a contemporary holiday rental retreat in Spain’s Cantabria community. Villa Slow is a contemporary holiday rental retreat in Spain’s Cantabria community. It was designed by Laura Alvarez Architecture with its design typology based on the traditional construction of the ‘peasant cabin’ in the area. Unlike the traditional cabins, Villa Slow has a contemporary twist and is placed on top of a little south-facing hill that grants its inhabitants with impressive views towards the valley and mountain. Villa Slow is designed and built with extreme mindfulness and care for detail. The house is very respectful with the environment. Its design is based on the traditional typology of a Pasiego House (Cabana Pasiega) but with a contemporary twist. The rough exterior stone walls and roofs contrast with the delicate interior wooden structure and details. Two big panoramic windows in the living room facing opposite directions create a beautiful scenography of mountains, clouds, and trees. The two rooms with their generous height are designed to allow different arrangements: just a couple, couple with children, friends, etc. Each room has its own bathroom fully equipped, barrier-free. Villa Slow is situated in a very special natural area well known for its spring water formation. The water of Villa Slow comes from its own spring. Villa Slow pays extreme attention to sustainability. Villa Slow is a passive house. It is provided with a heat pump, under floor heating and high quality insulation and windows for a minimum heat loss. All electronic appliances are A+++ and all lightning based on LED technology. The high performance glass warms up the interior in the winter and the big wooden shutters protect the summer from heat gain. 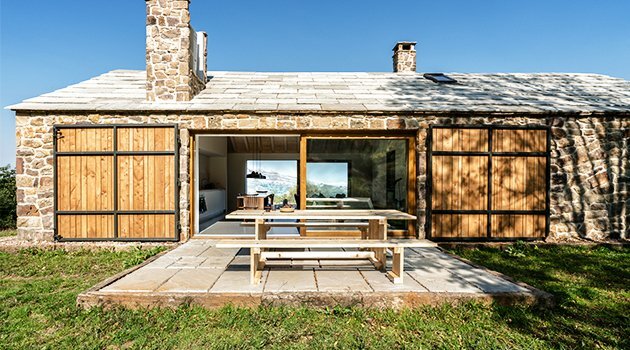 All materials used to build Villa Slow are reused from the old stone shed or come from the area of Cantabria.